Memory foam is one of the most popular mattress choices. Lately, there have been some new designs to try and address some of the issues with the original. If you want a cooler sleeping surface as well as the comfort of memory foam, you might want to look into gel memory foam. Here we will look at some of the best gel memory foam mattresses. Memory foam is a high-density polyurethane foam that was first created by NASA for use in space equipment. What makes memory foam so unique is that it has a very open cell structure or viscoelastic cells. This means that as you lay down on memory foam, it will mold itself to the unique contours of your body and when you get up it will slowly rise to its original shape. Memory foam’s ability to conform to your body allows it to provide a customized sleep surface as well as eliminate painful pressure points that traditional innerspring mattresses might cause. It will evenly distribute your weight for a more comfortable sleep. 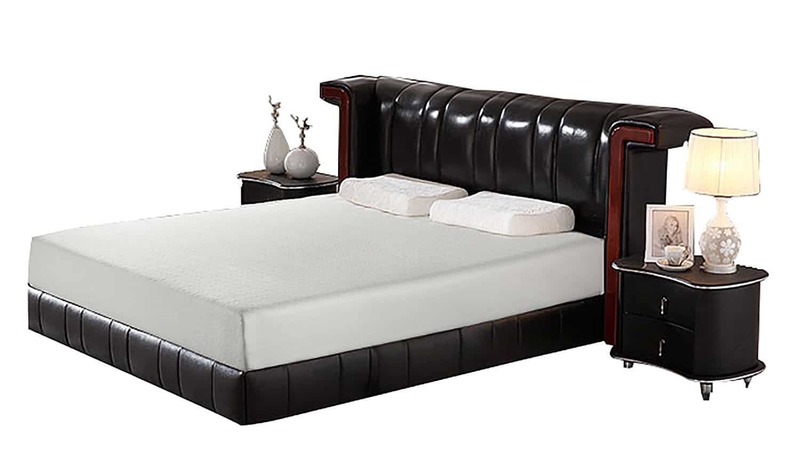 It also a highly supportive material, so while it feels very soft it will prevent you from sagging into the bed like you might on a different kind of mattress. This also makes a memory foam mattress very durable and good for people have weak or injured backs. Another nice feature of memory foam is that it eliminates the transfer of motion which makes it a really popular choice for couples. If you move around while you sleep, you will not disturb the sleep of your partner. This is great for couples that go to bed at different times so you won’t wake up the other person as you get into bed. What Are The Problems With Memory Foam? There are two main complaints that people have with traditional memory foam. Fortunately, you can find memory foam beds that have been created to address these problems. Traditional memory foam can be made with harsh chemicals that are harmful to you and the environment. There is also a concern of VOC’s or off-gassing. This means as the mattress is used the chemicals used to make it break down and release into the air. This can cause allergic reactions and other negative side effects. Unfortunately, many memory foam mattresses are made with these chemicals or with a process that emits toxic chemicals. The good news is that there are memory foam mattresses available that are made without these harmful materials. Look for mattresses that are certified CertiPUR-US which means that they are safe and chemical free. This is the other big complaint about traditional memory foam. A memory foam mattress will not only take the shape of the weight on top of it, it will also adjust to the temperature. This can create a very hot sleeping surface and might make you uncomfortable. There have been a few different mattresses made to try and combat this problem. Some mattresses will be ventilated with air holes, or will use a shredded memory foam to create more air flow. Gel has also been used to help dissipate heat and keep a cooler mattress. Gel memory foam mattresses seem to be a successful way to keep the foam cool. What Types Of Gel Memory Foam Are Available? You can find three types of gel memory foam on the market today. Each one uses gel to try and keep the mattress cool but in slightly different ways. These types of gel memory foam mattresses will put a thin layer of gel material on top of the memory foam mattress. Gel is cooler than most materials and the idea is that the gel layer will pull heat away from your body and the mattress keeping you cool and comfortable. The one downside to a gel layer is that gel also acts like memory foam and will take on the temperature of its surroundings. So instead of keeping you cool, this gel layer could actually make you warmer than cool you off. This is another type of gel memory foam mattress and it uses tiny gel beads that are infused and dispersed throughout the inside of memory foam. This form of gel was made in answer to the problems that a solid layer of gel created. The idea is that the tiny gel beads will still draw heat away from you but because they are inside the layers of memory foam they will dissipate that heat out of the mattress rather than just sitting on top of the memory foam. This type of mattress combines a variety of different cooling techniques to help keep memory foam cool. Along with a gel infused mattress, there will also be air holes to help move air through the mattress. So while the gel beads will draw the heat away from your body, the air holes will allow that heat to move out of the mattress. This gel hybrid seems to be the more effective cooling technique and is starting to become a standard feature in memory foam mattresses. Is A Gel Memory Foam Mattress More Expensive? While a gel memory foam mattress might be a little more expensive than a traditional memory foam mattress, the difference is not that big. You can find many affordable gel options that won’t break your budget. Just make sure that you choose a quality product. Some cheaper options might not be as durable as the more expensive brands and might end up costing you more money in the long run. This memory foam mattress comes in four different sizes, twin, full, queen, and king. It is made with CertiPUR-US memory foam, so you don’t have to worry about any harsh chemicals in your home. There are three different layers of memory foam to make this a comfortable and supportive sleep surface. The bottom layer is a high-resilient base foam, the middle layer is gel infused memory foam, and the top layer is regular memory foam. The whole mattress is covered in a poly-jacquard fabric that has 3 zippers so it can be easily removed for washing as well as a non-slip bottom. This mattress also has a fire-resistant inner cover that meets federal flammability standards. The mattress will come compressed for easy transport but will expand to its regular size after it is opened. This mattress is made with Arctic Dreams own brand of memory foam, Energex. It combines the best qualities of memory foam and latex foam. It will still conform to your body, but it has a higher bounce and will return to its shape faster than traditional memory foam. There are three layers in this mattress and each layer is gel infused. There is also extra ventilation in the foam to help keep the mattress extra cool. There are six different sizes and all of Arctic Dreams memory foam is certified CertiPUR-US. This mattress comes with a super soft quilted top layer and it is backed by a 10-year warranty. All Arctic Dreams mattresses are made in the US. This is a memory foam mattress that uses a gel hybrid to help keep you as cool as possible while you sleep. There are three different layers and the top layer is gel infused. There is also a layer of ventilated airflow memory foam that will move air through the mattress. The base is a therapeutic support base. The whole mattress is covered in bamboo fiber that is naturally hypoallergenic, antimicrobial, and dust mite resistant. Brentwood’s memory foam is certified CertiPUR-US and all materials are made right in the US. This mattress comes in 12 different sizes that will fit any need and also has a 25-year warranty. The Perfect Cloud Gel-Max memory foam mattress uses a variety of techniques to keep you and your mattress cool while you sleep. The top layer of memory foam is an air infused memory foam that helps circulate air around the mattress. The second layer has gel infused memory foam to help draw heat away from your body. The bottom is a high-density support base. For even more cooling effect, this mattress is covered in an air ventilated knit cover that can be removed for easy washing. This bed can support up to 400 pounds and there are two different sizes to choose from. All Perfect Cloud beds come with a 25-year warranty. This mattress also comes with a poly-blend cover that can be removed with a zipper and is machine washable. The mattress is made in the US and comes with a 10-year limited warranty. This mattress will arrive compressed and rolled up but will expand to its regular size once you open it up.